Militant attacks on Avdiyivka did not stop. From midnight to 6 p.m., pro-Russian militants carried out 40 attacks on the positions of the antiterrorist operation (ATO) forces, wounding one Ukrainian serviceman, the ATO HQ said in regular evening update on Facebook on 6 February. In the Donetsk sector, they used 152-mm artillery, tanks, 120-mm and 82-mm mortars, grenade launchers, heavy machine guns and small arms to launch repeat attacks on the ATO positions near Avdiyivka. Snipers were also active near Avdiyivka and Kamyanka. Luhanske, Opytne and Zaytseve came under fire. 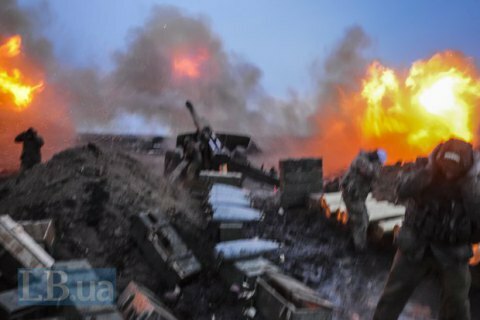 In the Mariupol sector, the militants fired with 122-mm artillery, grenade launchers and mortars of various calibres on Novohryhorivka, Lebedynske, Shyrokyne and Maryinka. Shyrokyne was also targeted by a tank while heavy machine guns were used against Novotroyitske. In the Luhansk sector, a tank fired on Novozvanivka, grenade launchers were used against Zhovte and Krymske. Six Ukrainian troops were wounded in Donbas on 5 February.